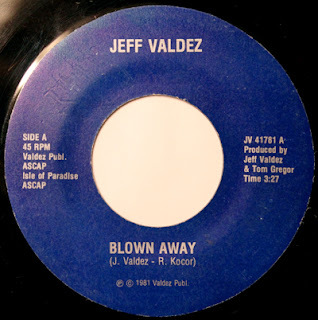 Do a search for "Jeff Valdez" and "Pueblo" in your favorite search engine, and you will find numerous stories, and background info. I'm not going to reinvent the wheel, by copying and pasting everything on here, but it's a pretty darn cool story: Poor kid from Pueblo, who found fame and fortune, etc., etc... (Wiki entry). Valdez left Pueblo in 1974, after he graduated Central High. Somewhere between his time up in the Springs, doing stand-up comedy, and before he high-tailed it to California and became a media executive, he got together with Colorado Springs record producer Tom Gregor (who produced the Starr LP), and cut a single. "Blown Away" is a reggae-infused, ode to ganja, co-written by Rick Kocor, who played in the Colorado Springs-based band Giving Tree, of which Valdez was a member. On November 22, 1981, "Blown Away" was featured on the Dr. Demento Show, sandwiched inbetween "Granny Won't You Smoke Some Marijuana" by John Hartford, and Noel Coward's "Let's Do It." The flipside of the single features a 45-second "advertisement" for the fabricated movie "Farts From Hell," and a 3 minute monologue, "Your Friendly Neighbor."